Stripper's Guide: Watch American Experience "Ripley: Believe It or Not" Tonight !! 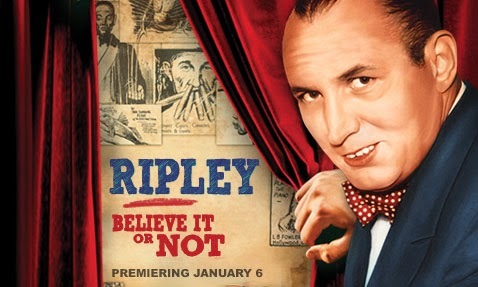 Watch American Experience "Ripley: Believe It or Not" Tonight !! Your Stripper's Guide host has been interviewed for a PBS documentary about Robert Ripley, and the program airs tonight at 9 PM on most PBS stations. For all I know I may have ended up on the cutting room floor, but it promises to be an interesting show whether or not yours truly makes an appearance. Be sure to tune in! To whet your Ripley appetite, here's an essay I wrote about the Believe It or Not man, which ended up not being used on the American Experience website. It's written for a general audience who might not know anything about Ripley, but I think I brought a perspective that you comics scholars might find interesting. As a cartooning historian, I could tell you some fascinating (to me) minutiae about the man that undoubtedly won’t appear in the documentary, but that would probably just make you click away to greener pastures. I really would like you to stick around for a moment, so I’m going to be rather daring. I’m going to tell you the unvarnished truth about Ripley. Now I’m not trying to be shocking, or flippant, or disrespectful. Really I’m not. Before I make my statement, I would like to point out, with all modesty, that I am a fellow who has devoted a good portion of his life to studying newspaper cartoons. I’ve written a somewhat authoritative book on the subject, and have earned a name for myself in the small (okay, tiny) community of newspaper cartooning researchers. Therefore, I make the following statement none too lightly, and with some expertise to back me up. Okay, here we go. The fact is, Robert Ripley was not much of a cartoonist. Yes, despite making millions off that art form, and becoming a household name, I’m telling you, as a cartoonist the guy was just barely adequate. In New York City in the 1910s, where Ripley planted his cartooning flag, there was no shortage of artistic talent. There were plenty of cartoonists who were more proficient in both drawing and writing than Ripley, though many of them pounded the pavement to no avail. The closest some of them ever got to a paying art gig was drawing flowers on dinner plates for a crockery company. Now you needn’t take my word for it. You can look at the historical record. With all the chutzpah of youth, Ripley came to New York after a less than stellar start to his cartooning career in San Francisco. New York City was the place to be for a cartoonist – the home of the most important (and most numerous) newspapers in the country. There were no less than 15 mainstream daily papers being published there in the 1910s, all vying for the attention, and pennies, of the man on the street. Now you’ve undoubtedly heard about yellow journalism, and how newspapers competed for readership in those days by out-scandalizing each other. News stories were overplayed in the most shameless ways, all in order to attract curious readers. While sensationalism was a big seller, cartoonists were almost as important. If you enjoyed Rube Goldberg, you bought the Evening Mail. If Mutt and Jeff tickled your funnybone, you bought The New York American. Every newspaper had its stars, though some shone brighter than others. Ripley, to his credit, managed to get a cartooning gig in New York right off the bat. But it was at the Globe and Commercial Advertiser, a newspaper so low on the totem pole of popularity that it sold mostly because it was offered for a penny, cheaper than most other papers. The Globe tried to follow the example of the more prominent New York dailies, and succeeded only in looking like the pale imitation that it was. The Globe’s cartoonists were second-raters by necessity. If a cartoonist showed up in The Globe and developed a following, he would have been quickly whisked off with an offer of better pay and greater exposure at a bigger paper. Cartoonists didn’t work for The Globe unless their services were not in great demand. Ripley was low man on the totem pole even at The Globe. His beat was mainly sports cartoons, which was a specialty that was already on the wane. Sports cartooning was a big pull for newspapers only while the art and science of newspaper photography was still being developed. Once newspapers could regularly offer shots of boxers and baseball players in action, the handwriting was on the wall for the sports cartoonists. Although they still had a following, in the 1910s and beyond their space and audience was steadily eroded by the cheaper and easier expedience of photography. Evidently, Ripley’s work at The Globe was not so exceptional as to make waves in New York City. Ripley toiled in relative obscurity at The Globe for over a decade, and then left only because the newspaper itself was merged into non-existence. He landed at the Evening Telegram, a paper that had a good reputation, but he never really got a foothold, and barely made it through a year there. By 1924, Ripley suffered a fate that would have had many cartoonists looking for a new career. He was reduced to working for a second-rate newspaper syndicate for a cut of the minor earnings to be had from selling his wares to out of town papers. So now you might be thinking that it must have been about then that Ripley came up with Believe It or Not, his life turned around, and he lived happily ever after. Oh, but not so. Not at all. Because Ripley was completely oblivious to having caught lightning in a bottle. He created Believe It or Not way back in 1918, long before his fortunes took some of their rockiest turns. According to some versions of the story, on that fateful day in 1918, his editor had suggested to him the idea for a cartoon about freakish sports records. But let’s give Rip the benefit of the doubt and say it was his own eureka moment. We may as well, because although the idea was in his lap, he evidently hadn’t a clue what to do with it. I think it is appropriate that we now invoke that famous line – Believe It Or Not – for this amazing fact: after that first cartoon, the second installment of Believe It or Not did not see print for another ten months! And after that, often months would continue to go by without a new installment of the sensational cartoon. I’m not going to give away any of the twists and turns that led to Believe It or Not becoming a multimedia sensation, and Ripley becoming arguably the richest newspaper cartoonist of his era. Suffice to say that Ripley, although he didn’t quite do everything in his power to keep it from happening, seemed unaware of the goldmine he was sitting on, and he had to be led by the nose into the promised land of money and stardom. Now that I’ve made my case, you may well be thinking that I’m trying to run down this poor guy. Blah blah, not much of a cartoonist, yada yada success was the result of dumb luck, blah blah most anyone else in the same situation would have done as well or better than Ripley. Okay, I admit I did give the guy a pretty serious goosing. But here’s the thing. What I didn’t mention is that Ripley had one quality that is quite rare and amazing, and it is that quality, in my opinion, that led to his fame and fortune. Now when I say what the quality is, most of you are going to roll your eyes, and say “Oh, please!” And if I hadn’t studied Ripley’s life and personality, I promise you, I’d be in the same pew. Here it is: Ripley’s secret recipe for success was simply that he believed in himself. From the moment he woke up in the morning, until the moment he fell asleep at night, he knew that he was destined for big things. He knew that however dark it might seem, that the sun was just beyond the horizon waiting to shine its light on his face. He believed in himself to the core of his being, just like all those cheesy self-help gurus tell us we ought to. Ripley had no great ability, no great work ethic, no dazzling intellect, and I have no doubt he was told that many, many times. New York is not a kind city, and the New York newspaper office of his era was no place for people who couldn’t handle criticism. Even outside the newspaper office, Ripley must have been a constant target of derision. He looked goofy, he dressed badly, and he had a speech impediment. Most of us would be hiding under a rock if we were in his shoes. But not Ripley. He took it all in stride, secure in the blissful knowledge that he was Special. Ripley had no Tony Robbins tapes, no visits to the Maharishi. He seems to have had little or no spiritual life, his interest in religion being mostly a fascination for odd or bizarre rituals he could use in his cartoons. No, it seems to have been something in his upbringing, something incredibly positive and self-affirming, that stuck so deep in his psyche that no amount of evidence to the contrary could shake the belief he had in himself. Ripley knew that he would end up one of life’s big winners, and he just sat back, enjoyed the ride and waited for the inevitable to happen – and it did. You did an excellent job! Enjoyed the show. I was watching it with my wife and when you first popped on screen I told her "I know him! He sent me a package once!" Alan congrats on making the cut! I recorded the show and watched later with my wife. I told her I knew you through Jim and she through that was pretty cool... which it is!